KODAK Water-Resistant Scrim Banner raises the performance bar by providing a scratch and water-resistant surface with a white point never before seen on a banner substrate. KODAK Water-Resistant Scrim Banner is a 16-mil, scrim-reinforced vinyl designed to create spectacular, high impact, cost-effective graphics that will stand up to the test of time. 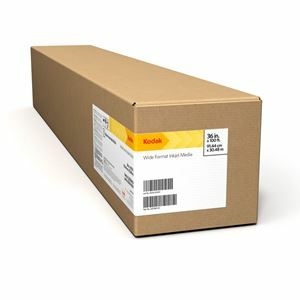 KODAK Water-Resistant Scrim Banner not only extends the life of the graphic, it also provides easier handling, creating efficiency in production so that users can compete for high-volume banner jobs with the one-two punch of economy and quality. It is compatible with both thermal and piezo printing technologies.